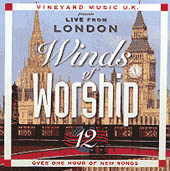 Like a breathe of fresh air, the Winds of Worship series gets new life in Winds of Worship 12  Live From London. After the disappointment that Winds of Worship 11 was, I was looking forward to seeing what was next. I heard this album from a friend 3 weeks before it was released in the states on the European release Come, Now Is The Time. After hearing this I couldnt wait for it to hit our soil! Come, Now is The Time To Worship is a great opener. I use it all the time now in worship leading. It got me so pumped when I was listening to it that I got up on my feet in the middle of my living room and started to praise the Lord! This is the better of the two version of this song that I have heard. The one off Fathers Heart #37 is good, but this one is excellent! Lord Reign In Me rocks! Second song in and Im there in the throne room before God! I hope to hear more from Brenton. His voice is awesome. The last time a heard a voice so clean and pure I was listening to Andy Park. The CD slows down a tad after this. Jesus, Jesus (Take Me As I Am) is a good worship song, not great, but good. A Place In The Hills is a little too Titanic for me. If you listen to this song you will know what I mean. Holy Fire is a great song of longing for revival. This is an awesome worship song. Who Is Like Our God gets a face-lift in this version. I thought the original on TFH #26 was great until I heard this. WOW! In the style of the Polices Every Breathe You Take this song moves me. The Lord Is Gracious And Compassionate has a great Memphis Blues sound to it. Beautiful God has pure hip-hop pop all over it! All Who Are Thirsty is another great 6 / 8 worship song from Vineyard. God Of Glory and Holy Is The Lord flow well into each other. I love the electric guitar solo in God of Glory. Who Is This is a straight forward driving song that flows great. The album ends on a down note with O Jesus Mine. This is kind of a sad way to end such a great recording. Again this song falls into the Titanic sound. This is the best Winds of Worship since Winds of Worship 4! Keep it up Vineyard. Purchase this CD now!